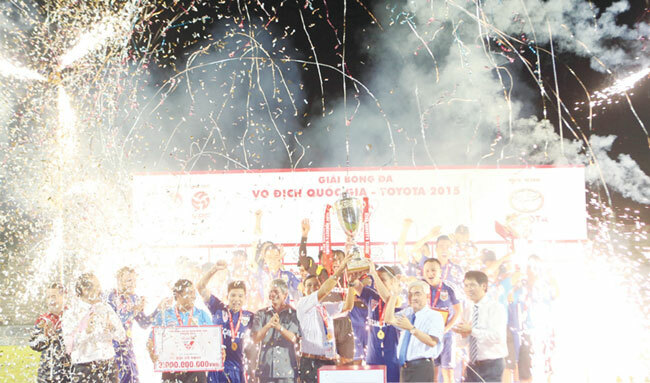 HA NOI (VNS) — Becamex Binh Duong held onto their V.League 1 trophy in style, with a brilliant 4-2 victory over Dong Thap in the final round match of yesterday's tournament. The champions successfully defended their top position two rounds before the end of the premier league season. Two weeks later, they were awarded the crown at Dong Thap Stadium, together with a bonus of VND10 billion (US$454,000) from the organisers and sponsors. Becamex Binh Duong will also represent Viet Nam in the Toyota Mekong Club Championship, a tournament for winning teams from Thailand, Laos, Cambodia and Myanmar. Last year, Becamex Binh Duong beat Myanmar's Ayeyawadi 4-1 in the final. Thoudsand kilometres to the North, Dong Nai suffered a sad finish, as they said good-bye to the V.League 1 after a poor season. Dong Nai, despite their struggle in the final rounds, failed to improve their position. Yesterday they lost 1-4 to Quang Ninh Coal, although they had an opening goal in the beginning of the first half. Next year, Dong Nai will join seven other teams in the V.League 2 tournament. Ha Noi FC will now replace them to compete in the national top competition. At Long An Stadium, Ha Noi T&T reached their target of being the second-place team, after a 3-1 victor over Dong Tam Long An on away ground. This is the fifth time in a row that the former champions won. At Lach Tray Stadium, Hai Phong tied former winner Song Lam Nghe An 2-2. Hai Phong, which finished sixth with 41 points, have prepared for the new season with a three-year contract with overseas Vietnamese centre midfielder Keven Nguyen, following three weeks of tryouts. Keven, 18, currently plays football in the US. He recently sent a letter to express his desire to compete for the national U19 squad, as well as in the V.League 1. He will have to persuade coach Hoang Anh Tuan of the U19s before the team leaves for the Asian U19 qualification tournament later this month in Myanmar. Meanwhile, Song Lam Nghe An will not have defender Que Ngoc Hai during the first six month of the new season, as the national U23 captain was suspended from the Viet Nam Football Federation last week. Hai was also fined VND15 million ($660) for his tackle in the previous round match, which left SHB Da Nang's player Tran Anh Khoa seriously injured, and which may end his professional football career. Hai is also being asked to pay all hospital fees for Khoa. Nguyen Minh Phuong, who announced his retirement yesterday. The former national member shared his decision with thousands of fans after a 0-0 draw between Da Nang and FLC Thanh Hoa on their home turf in Chi Lang Stadium. During his 17-year career, the captain won four V. League titles while playing for three teams, and was presented a Golden Ball as the best player of the year in 2010. Earlier, he received Silver Balls in 2006 and 2007. In 2012 he earned a Bronze Ball award. Phuong has played 72 times for the national team, scoring 12 goals. He was also on the team that won the ASEAN Football Federation Cup in 2008, the highest achievement in Viet Nam football.